One of the most significant events in any woman’s life is her engagement, a time when she accepts a proposal of marriage from her beloved. 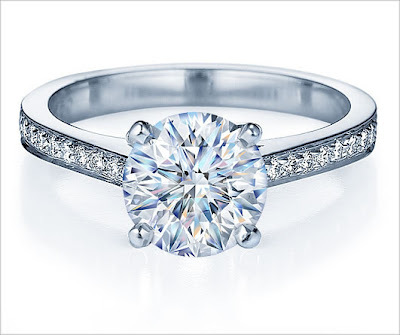 As a sign of his love and commitment to her, she can expect to receive a diamond engagement ring, a sparkler that she will cherish the rest of her life. Clearly, an engagement ring purchase isn’t a decision that should be rushed. For many men, a primer in diamond education is needed, the sort of instruction which can ensure that the diamond engagement ring being purchased is the right one. Please read on for some helpful ring buying advice designed to make your choice the best one, since there are so many styles, shapes, & setting options for Engagement Rings. Quality - Some would say that there isn’t such a thing as a poor quality engagement ring, but I beg to differ. Quite honestly, if the ring doesn’t include a diamond gemstone, then you’re choosing a lower quality rock. Emeralds, rubies, sapphires, and amethysts may look pretty, but they don’t rise to the level of hardness or have that special look of a diamond. She’ll know it too and wonder who convinced you otherwise! Style - Maybe you are already familiar with her tastes in jewelry, perhaps not. Many women enjoy gold bands as it is one style that always remains popular, but perhaps a ring with diamonds embedded in the channel is her preference? She needs to be comfortable with the style you select as she’ll be wearing the ring every day for many years to come. Consider a custom-made ring if that would please her the most. Metal - You’ll find that there are a variety of wedding bands available with three metals typically shown: yellow gold, white gold, and platinum. Forget the silver band – though some retailers offer them, they are cheap-looking and won’t stand the test of time. Yellow gold is the most popular of all with 14k and 18k gold used. White gold has the look of silver but retains the worth of gold, a choice she may prefer over yellow gold. Platinum is the most durable metal — and the most expensive – the perfect symbol of a marriage that will stand the test of time. Center Stone - Many women prefer a diamond engagement ring with the stone in the center by itself while others favor the center stone with sidestones or with three stones. A diamond solitaire is cut in a variety of shapes including round, princess, emerald, asscher, marquise, oval, radiant, pear, heart and cushion. There are some people who consider personality traits that supposedly match each shape, but if you’re simply looking for the best investment go with a round brilliant ring and you’ll not be disappointed. Other Considerations - You’ll probably hear about the 4Cs of diamond characteristics (cut, carat, color, clarity), with cut already mentioned. The carat represents the size of the diamond, while color is its natural body color with D,E, and F grades colorless (and the most rare) all the way down to Z, which is light yellow in color. Clarity describes a diamond’s purity or the elements which give each diamond its unique look, kind of like a birthmark. You can find quite a few diamonds which are not at the very top of the scale that are still quite beautiful and which look virtually the same as the most expensive grade of diamond, but for less money. Of course, your personal budget must be considered when purchasing a ring. Conventional wisdom suggests that you spend at least two weeks of your salary on a diamond engagement ring, but at James Allen, we have beautiful rings available that start at $250. Weigh her needs with your wallet and you’ll find the perfect diamond engagement ring for a couple soon to be married. Finally, it can be mind-boggling deciding which diamond is best – your local jeweler can help you out or, if you are buying through James Allen, we have advisors standing by who make your diamond education a fast learn!